Leave No Trace is a 2018 American drama directed by Debra Granik and written by Granik and Anne Rosellini, based on the novel My Abandonment by Peter Rock. The plot follows a veteran father with PTSD (Ben Foster) who lives in the forest with his young daughter (Thomasin McKenzie). It premiered at the 2018 Sundance Film Festival. 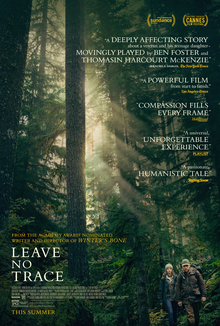 The film received universal critical acclaim, with praise for the performances of Foster and McKenzie, and, it is the second-most reviewed film to hold an approval rating of 100% on Rotten Tomatoes.